Just a couple of months after social democratic chancellor hopeful Peer Steinbrück flipped the bird on the cover of a top German news magazine, the middle finger is back at the heart of a European election campaign. Mr. Cerny said the monumental hand with its 16-foot-long outstretched middle finger, placed on a float facing the castle, was a “scream of alarm” against the state of politics in the Czech Republic, endemic corruption and Mr. Zeman, a former leftist prime minister, whom he accused of becoming intoxicated with power. He said the sculpture, which he gave an unprintable title, was also aimed at the country’s Communist Party, which could gain a share of power in the coming elections for the first time since the revolution that overthrew communism more than two decades ago. 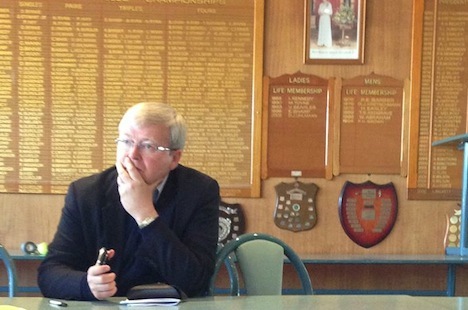 Here’s a longer look at the circumstances leading up to the weekend’s snap elections. Photo credit to Michal Cizekmichal/AFP/Getty. Although it was caretaker prime minister Jiří Rusnok that lost today’s vote of no confidence by a margin of 100 to 93 in the Czech parliament, but the real loser is the Czech Republic’s new president Miloš Zeman — albeit only temporarily. Zeman appointed Rusnok (pictured above) prime minister in late June after the collapse of the government of conservative prime minister Petr Nečas stemming from a sensational espionage and corruption scandal. 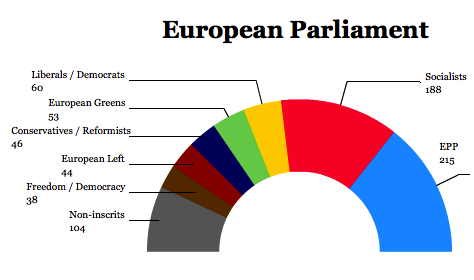 You might expect that, as in most parliamentary systems, Zeman would have appointed a replacement prime minister who comes from the party or coalition of parties that currently wields a majority. 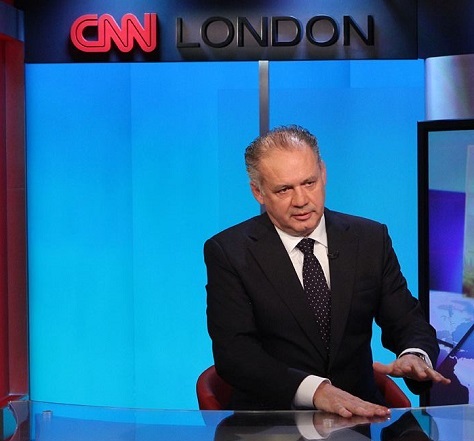 Instead, he appointed Rusnok, an acolyte who served as Zeman’s finance minister from 2001 to 2002 and later as the minister of industry and trade under Zeman’s social democratic successor, Vladimír Špidla. 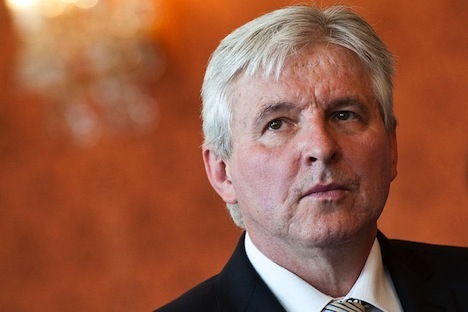 When Nečas resigned, it was a stroke of luck for Zeman, who took over as president only in March 2013 and who is pushing to consolidate more power within the presidency at the expense of the Czech parliament. 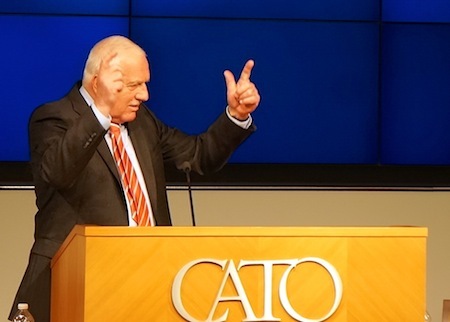 Though both of his predecessors — playwright and freedom fighter Václav Havel nor euroskpetic Václav Klaus — played outsized roles as president due to their gravitas and outspokenness, Zeman argues that his direct mandate from the Czech people should provide him a more hands-on role in setting Czech policy (Before January’s direct election, the Czech president was indirectly elected by the parliament). 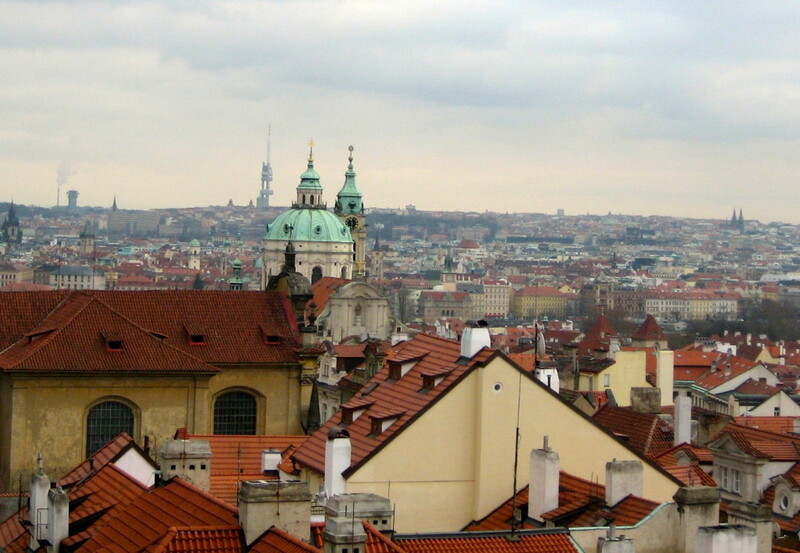 By appointing his own economic adviser as prime minister, Zeman could immediately begin to shape the Czech government according to his own prerogative. But Zeman’s presidential power grab is a longer-term project than just the Rusnok vote today, and though his attempt to install Rusnok failed, it served a very important purpose for Zeman by bringing the chief center-left party, the Česká strana sociálně demokratická (ČSSD, Czech Social Democratic Party), more fully under his influence. 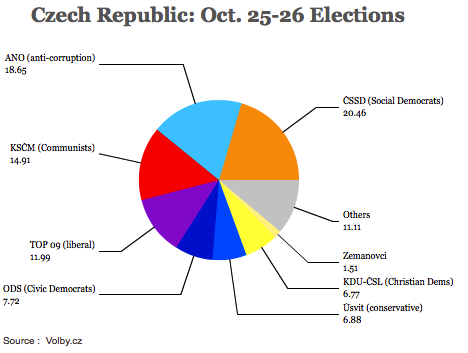 With polls showing that the ČSSD is set to win the next Czech parliamentary election, that’s arguably an even important goal for Zeman’s long-run designs than installing Rusnok as prime minister. Czech voters returned to the polls yesterday and today for the runoff in the Czech Republic’s first direct election for president. 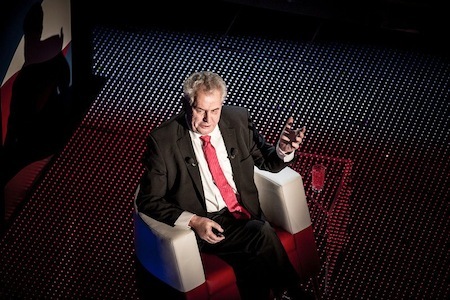 Former social democratic prime minister Miloš Zeman has defeated the current more conservative foreign minister Karel Schwarzenberg by a margin of around 54.8% to just 45.2% for Schwarzenberg. Schwarzenberg emerged as a surprise challenger to Zeman after the first round, edging out former prime minister Jan Fischer, setting up a runoff that featured two candidates with incredibly colorful personalities. 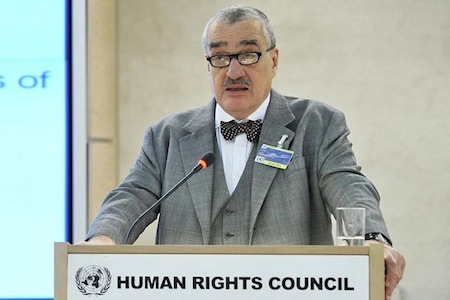 Schwarzenberg, who belongs to the Bavarian nobility, spent much of his life in Austria, where his family lived in exile during the Communist occupation of Czechoslovakia, increasingly fighting in the 1980s alongside Václav Havel to liberate the country from Soviet rule. 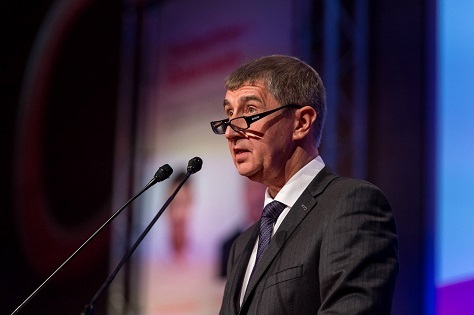 As the leader of the Tradice Odpovědnost Prosperita 09 or ‘TOP 09′ (Tradition Responsibility Prosperity 09), which he formed for the 2010 Czech parliamentary elections, his party is the second-largest member of the coalition headed by prime minister Petr Nečas, the leader of the Občanská demokratická strana (ODS, Civic Democratic Party). Zeman, formerly a prime minister from 1998 to 2002 from the Czech Republic’s main center-left party, the Česká strana sociálně demokratická (ČSSD, Czech Social Democratic Party), is known for his sharp wit and aggressive persona, but lost his first run for the presidency in 2003 to the outgoing incumbent, Václav Klaus. Zeman, at odds with the current ČSSD leadership, left the party in 2009 to form his own. While Schwarzenberg peaked at the end of the first round, and certainly entered the second round with a bit of momentum, it wasn’t enough to power a 75-year-old aristocrat with a penchant for napping, into the Czech presidency. It certainly didn’t help that Schwarzenberg spent three decades outside of the country and his Czech language skills were sometimes seen as less than pristine, and Zeman’s campaign took advantage of the perceived ‘otherness’ of his opponent. Zeman’s supporters even intimated, despite any evidence, that Schwarzenberg’s family collaborated with Nazis. World War II featured as an issue in a debate between the two candidates when Schwarzenberg claimed that the Beneš decrees, which dealt with the expulsion of ethnic Germans from Czechoslovakia after World War II would today be considered a war crime, and Zeman responded by attacking Schwarzenberg as a Sudaten German himself. 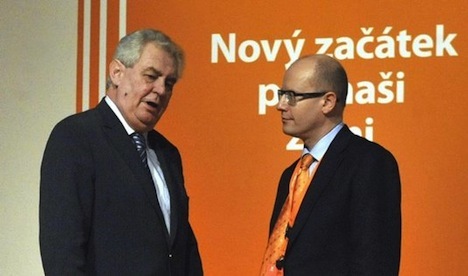 Zeman and Schwarzenberg both achieved endorsements from unlikely sources in the second round. Despite their ideological differences, Zeman long ago won Klaus’s endorsement (Klaus also enabled Zeman’s prime ministerial term in 1998 when he agreed to support the government in exchange for patronage and government positions for the ODS). Zeman and Klaus belong to the same generation of Czech political leadership, and many see in Zeman a lot of the same qualities as Klaus, who has been outspokenly conservative as president, outspokenly eurosceptic and even cast doubts on the validity of manmade climate change. 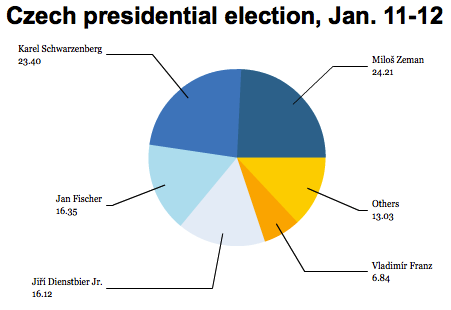 Fischer, who could have been expected to endorse Schwarzenberg as a more center-right candidate, failed to do so. He didn’t endorse Zeman, but he said that he could not vote for Schwarzenberg. Furthermore, the official ČSSD candidate, Jiří Dienstbier Jr., who finished a surprisingly strong fourth place in the first round, said that he could not vote for Zeman. Although other ČSSD leaders endorsed Zeman, they were certainly less than enthusiastic in their support. Although it’s likely that Zeman won the share of ČSSD voters, his win today makes it likely that the next five years will feature an awkward relationship between Zeman’s camp and the formal ČSSD leadership. The tattooed fifth-place finisher, Vladimír Franz, endorsed Zeman, after attracting worldwide attention in advance of the first round. Although Franz’s voters likely leaned to the left, they were younger and urban, a constituency to which Schwarzenberg appealed — Zeman’s voter base featured older and more rural voters. 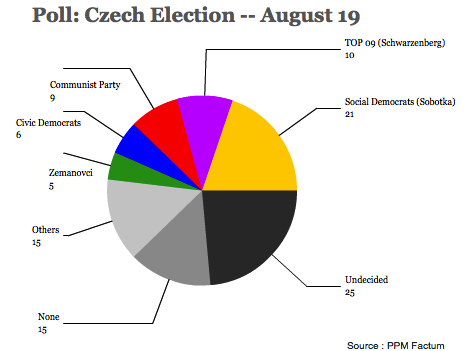 Although Havel, who served as president of Czechoslovakia from 1989 to 1993 and, after the 1993 breakup of the union, the Czech Republic, until 2003, wasn’t as universally popular within the Czech Republic, I wonder if the election would have turned out differently if Havel were still alive to endorse and campaign for his longtime friend Schwarzenberg. Havel died just 13 months ago in December 2011. 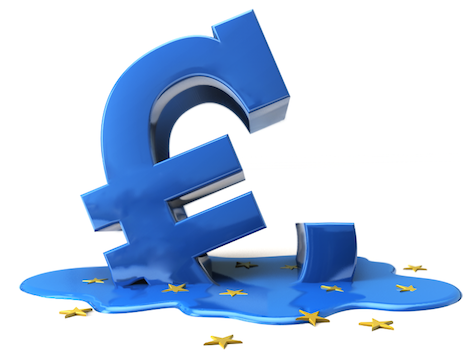 Ultimately, the massive unpopularity of the Nečas government, certainly made a Schwarzenberg victory an uphill challenge, given the double misery of a troubled economy and, like in many European countries these days, pursuing a policy of budget cuts and economic reform. 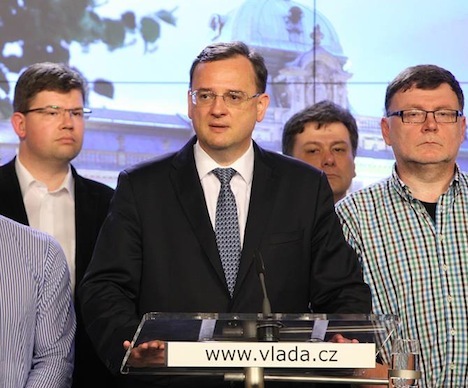 In the first round, the official ODS candidate, Přemysl Sobotka, a senator, won just 2.46% and placed eighth out of nine candidates. With the emergence of Czech foreign minister Karel Schwarzenberg as one of two finalists for the Czech presidency in a runoff to be held later this month, it’s worth taking a closer look at the House of Schwarzenberg and its role in European history throughout the centuries. The house dates back to the Middle Ages, and perhaps its most illustrious member was once referred to as the ‘Austrian Bismarck’ for guiding the Austro-Hungarian empire during the tumultuous and revolutionary 1840s. 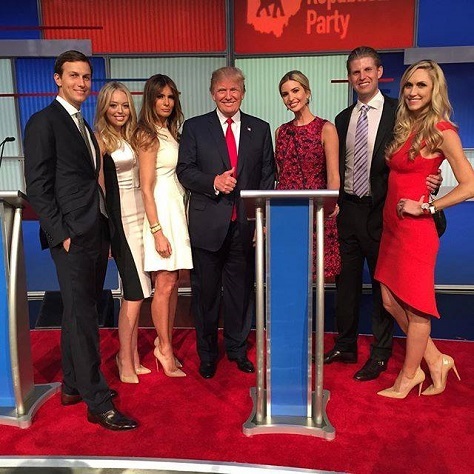 So if he wins the runoff on January 26, Karel Schwarzenberg will become an elected head of state with familial ties running throughout the remnants of European monarchy. Schwarzenberg’s mother belonged to another princely family, the Fürstenbergs, making him cousins with the late fashion designer Egon von Fürstenberg. He was also second cousins with Ranier III, who was the prince of Monaco from 1949 until his death in 2005. The family was initially based Franconia, in what is present-day Bavaria in Germany, and you can tour the ‘Schloss Schwarzenberg’ near Scheinfeld in Bavaria today. Rebuilt in 1618 after its destruction by a fire, it was increasingly less important as the family’s base moved from Franconia to Bohemia in the heart of what is today the Czech Republic in the 17th century (though the castle was occupied by the Nazis during World War II, used as an American hospital on their march to Nuremberg, and it was transformed into a center for Czech literature in 1986). One of the most influential of the earliest Schwarzenbergs was Johann, a close friend of Martin Luther, an episcopal judge who revised his court’s code of evidence and an influential member of the government of the Holy Roman Empire. Adam, Count of Schwarzenberg, played a unique role as a top adviser of the Brandenburg Privy Council in the 1630s during the reign of elector George William, keeping Brandenburg neutral during the Thirty Years’ War, though he was ultimately forced to raise an army to expel invading Swedes and became the de facto ruler of Brandenburg from 1638 to 1640 when George William was forced into exile. 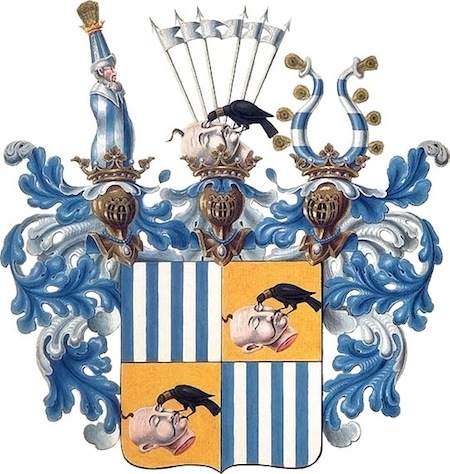 The Schwarzenberg coat of arms (pictured above) features a rather graphic tale about central Europe’s battles with the Ottoman Empire — a raven is pecking away at the head of a Turkish man, which was meant to symbolize the 1598 capture of a fortress, Raab (which translates to ‘raven’) in present-day Hungary. 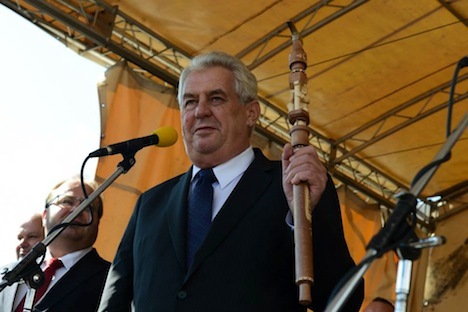 This weekend’s Czech presidential election resulted in something of a surprise, with center-right foreign minister Karel Schwarzenberg (pictured above) surging to a very close second place against front-running center-left candidate and former prime minister Miloš Zeman. Zeman and Schwarzenberg will now compete in a runoff to be held on January 25 and 26 in the Czech Republic’s first direct presidential election in its post-Cold War history to succeed Václav Klaus, the Czech Republic’s president since 2003, an outspoken conservative and euroskeptic. Schwarzenberg won a surprisingly high 23.40% of the vote, trailing less than 1% behind Zeman, edging out a statistician and former caretaker prime minister Jan Fischer, who won just 16.35% and nearly finished in fourth place behind another center-left candidate, Jiří Dienstbier Jr. Fischer led polls as recently as a week or two ago, though his performance in a debate against Zeman in early January was seen as lackluster, fueling a boom for Zeman’s poll support heading into last weekend’s vote. 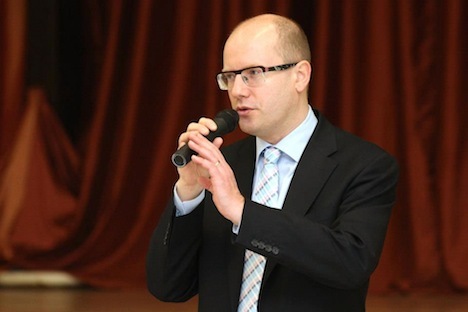 Ominously for the current Czech government, the candidate of the governing Občanská demokratická strana (ODS, Civic Democratic Party), Přemysl Sobotka, a senator, finished in 8th place with just 2.46% of the vote, likely a result of his relatively obscurity in a field of longtime titans of Czech political life and of the brutal austerity measures that the current ODS-led government of Petr Nečas. Schwarzenberg won throughout the center of the country in his native Bohemia and in Prague and other urban areas; Zeman dominated much of the rest of the country, including rural Moravia in the east and rural areas in the north.